Oh, I have sooooooo been waiting for this! And it wasn’t just from Pike this time. Saru and Tilly got some quality banter in. Burnham got more character development with her line, “Fortunately, I was raised on Vulcan—we don’t do funny…” than she got through moping her way through season one. Stamets got some banter. The new grumpy doctor got some banter. Heck, even Detmer got some banter!! And these weren’t just opportunities for a quick chuckle. They expanded these characters. We now know that Saru learned 90 languages (seriously?) to try to fit in with his new Federation friends. We know that Burnham is well aware that the Vulcan way isn’t always the best way (at least when it comes to breaking the tension with light humor). And we know that Detmer got her pilot’s license at the age of twelve. That’s the stuff Wiki pages are made of, folks (and fan films, for that matter!). It wasn’t until this episode that I realized just how infrequently the Discovery crew beams down to an actual planet to seek out new life and new civilizations. There was that one episode in season one that everyone liked (“Si Vis Pacem, Para Bellum”) where Saru has a freak-out…and what else? The desert planet in the pilot episode, the planet in the mirror universe where they met the resistance, the Klingon homeworld, and Earth (oh, and we saw Vulcan in a flashback). In the first 16 episodes, that’s 4 or 5 planets walked on. 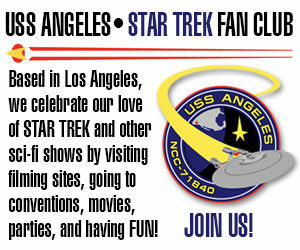 In the first 16 aired episodes of TOS, do you know how many planets the crew beamed down to? THIRTEEN! Only three episodes didn’t include a planet (“Charlie X,” “The Corbomite Maneuver,” and “Balance of Terror”—just saved you looking it up on Google). I’m not saying that you always need to feature a planet to feel like Star Trek. Some of the best episodes of all of the series (“Doomsday Machine,” “Tribbles,” “Measure of a Man,” “Best of Both Worlds, Part II,” “In the Pale Moonlight,” “Scorpion”) never showed a landing party or away team. But at least there was a balance. On Discovery, the ratio of planetfalls felt very UNbalanced. THREE CHEERS FOR THE LITTLE GUYS! And as I said, Detmer got a chance to do some acting this episode, as well. There was even a little dialog thrown to Bryce and Airiam, although they didn’t really get much this time. But there’s hope! AN HONEST-TO-GOD PRIME DIRECTIVE EPISODE! Prime Directive episodes can be fascinating moral conundrums for our characters. Sure, most Prime Directive (or General Order One) episodes end up being elaborate excuses for Kirk or Picard or Janeway to violate the Prime Directive—and (SPOILER ALERT!) Pike was no different this time. 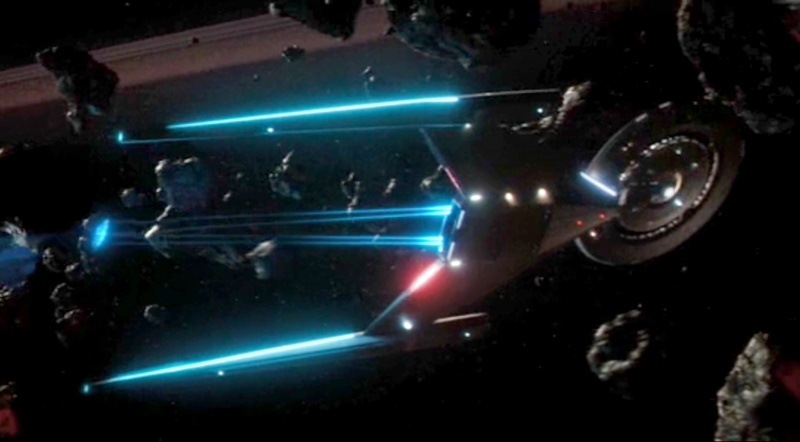 But it’s not the destination that makes these episodes so fascinating; it’s the journey (the trek) getting there. Prime Directive episodes usually pit “brother against brother” in arguing the impossible moral questions of total non-interference. Does Kirk arm the Hill People with flintlocks to save them? McCoy pleads with him not to release a the serpent of endless war into eden. Picard is resigned to allow the people of Drema IV to perish…until a little girl’s desperate voice asks Data for help. This time, the debate is between Pike, a thoughtful captain raised by a father walking the paths of both scientist and theologian, and Burnham, a women of pure science and logic who often makes rash decisions and disobeys orders. Yin and Yang, perhaps, but Yin is in command, and (SPOILER ALERT!) Yang ultimately follows his orders. That scene at the end where Burnham says, “Sir, I learned the hard way where not following orders can lead to…” did more to define her character and growth than almost anything in season one (including that three-minute speech at the end of the finale). And it was all set up by that Prime Directive conflict. Star Trek was never intended as a “dark” show. Oh, sure, there was the “darker” Deep Space Nine and season three of Enterprise. But at its heart, Star Trek is about good people trying their hardest to do good things for good reasons. That’s why an episode like “In the Pale Moonlight” of DS9 (where Sisko, with Garak’s help, tricks the Romulans into entering the Dominion War on the side of the Federation) works so well. What Sisko did was so UN-Star Trek that, even two decades later, fans still talk about it as a defining moment for the character. If Trek were dark like that all the time, “In the Pale Moonlight” would have been just another day at the office. Now the Discovery crew, thanks in part to Pike’s arrival, are back to being good people again—to each other and to the rest of the galaxy. 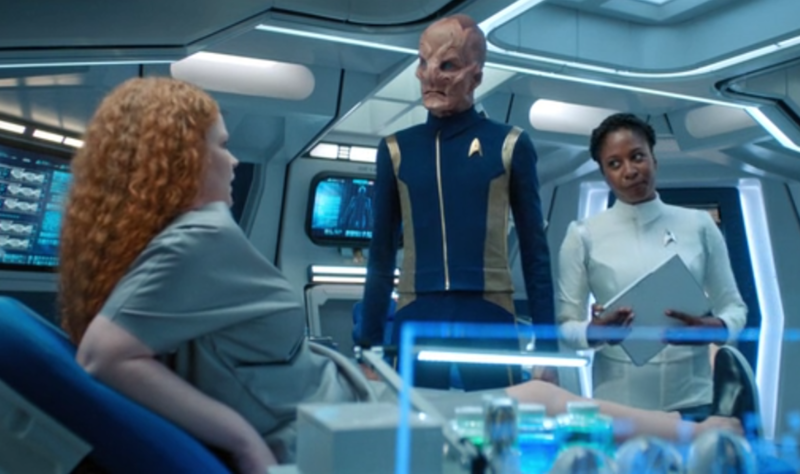 Gone and almost unrecognizable is the cynical and dysfunction-ridden USS Discovery that Burnham first stepped foot on on the third episode. Gone is Lorca…along with all the fan “Lorcapologists” from the early episodes who said, “Just give him a chance; he’s been through a horrible war…” or “I like this new, darker kind of starship captain…” Lorca wasn’t Star Trek or Starfleet, and his ultimate reveal as Mirror Lorca proved that. In his first episode, Pike says, “I’m not him; I’m not Lorca” and that’s all we fans need to know. But just in case we didn’t get the memo, the sets themselves have been lit brighter this season. I noticed when Burnham walked into the captain’s ready room for the first time and I saw something I’d never seen before: the captain’s ready room! Sure, we’d had many scenes there in season one, but they were so dimly lit that I could barely see this beautiful set. Now it’s got light streaming in and it looks gorgeous, welcoming, hopeful…just like the show itself. Sure, it’s not as brightly lit as TOS or TNG or The Orville—and that’s okay. Some shadows and darkness can help give definition to the light. I’m just glad the light is no longer being swallowed by the darkness. Last week, I said, “I LIKE PIKE!” Well, now I LOVE him! Don’t tell my wife, but that Anson Mount is a total heart throb. But more than that, he is an amazingly gifted actor. He carries his scenes forward without stealing them, with a quiet and calming presence that creates a solid foundation on which other actors can elevate their own performances. Burnham never comes off better than when she’s playing a scene with Pike…no matter if they’re arguing, joking, or just connecting on a deep, introspective level. 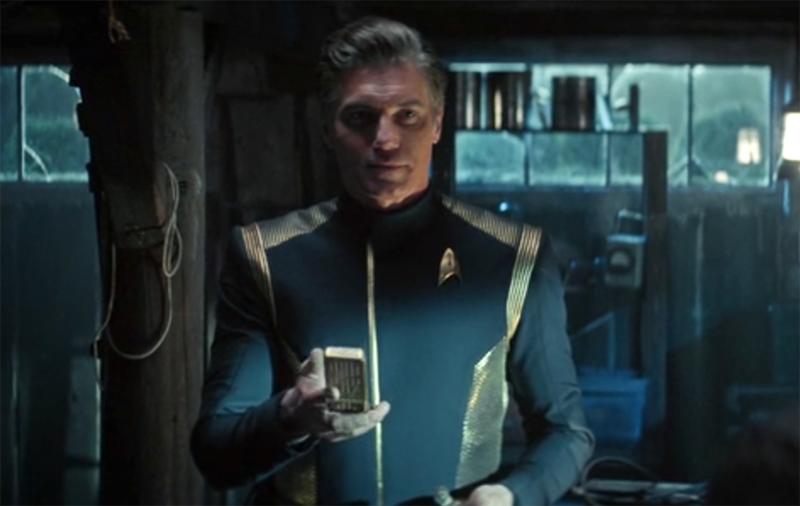 I actually sorta see Pike’s arrival in season two being very similar to Bruce Boxleitner’s Captain John Sheridan arriving on Babylon 5 in its second season. After the “brooding” Commander Jeffrey Sinclair, Sheridan was a welcome breath of fresh air, bright and enthusiastic. Pike is the same way. “If you’re telling me this ship can skip across the universe on a highway made of mushrooms, I kinda have to go on faith.” I feel the same way! But now I feel like at least someone else (on the show) is acknowledging how ridiculous this spore drive is. That never happened in season one. Other fans have seen Tilly as the new Wesley Crusher—smart, awkward, wholesome, and always saving the ship (although Wesley would NEVER use the F-word!). This episode, however, while she showed a little of both Lucy and Wesley, Tilly was definitely Tilly…and not nearly as annoying as I’ve found her previously. 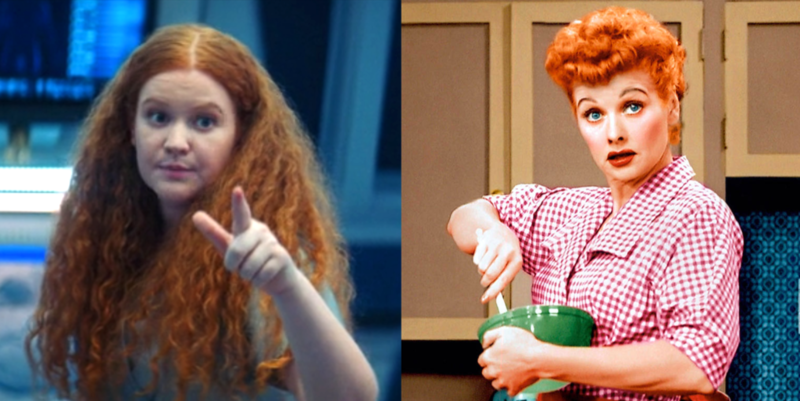 Maybe it’s just Mary Wiseman’s solid acting (others might get swallowed by that part and play it only for laughs). Maybe it’s her new imaginary “I see dead people” friend, May…who seems to be even more awkward and clingy than Tilly (if that’s even possible!). But somehow Tilly stood up on her own this episode, saved the day in a heroic way, and had me not only rooting for her but actually wanting to see MORE of her! LOOK, MA, NO BAD GUY! Quick, name at episode from season one that did NOT have a bad guy, a villain, or a heavy. Sorry, trick question—there wasn’t one. Whether it was T’Kuvma, Mudd, L’Rell, a berserk Tardigrade, Empress Georgiou, Mirror Lorca, or just the Terran or Klingon empires, there was always someone threatening our heroes, someone we could root against and hate. And honestly, Star Trek has its fair share of good (and bad) villains: Khan, Kor, Q, Lore, The Borg, Gul Dukat, Weyoun, the Hirogen, Species 8472…the list goes on and on. But sometimes it’s nice to just take a break from all of the evil and malevolence of a galaxy that’s trying to destroy you and just, y’know, explore strange, new worlds. This episode, and last episode too, gave us just that. The Discovery is trying to solve a cosmic puzzle. No one is shooting at them (at least, not yet), and because of that, the crew gets to do a little marveling at the mysteries of the universe and use their problem-solving abilities for things like science instead of combat (or science being used for combat). Star Trek was always at its strongest when doing the pseudo-science thing. Sure, some stuff was a little far-fetched (no one’s building a Dyson sphere, folks—you’d need the natural resources of ten million planets). But Trek was just sciency enough to seem plausible and inspire young people to learn more (at least, that was the case in the 1970s and 80s). This episode, we got to see a super-dense asteroid with a massive gravity field being used to drag away radioactive ring fragments like a magnet pulling iron filings. Sure, I saw that solution coming a light-year away, but it was still a cool bit of science! And I didn’t even mind the use of the magic mushrooms to save the day because it wasn’t the centerpiece of the rescue but only a small part of it. While Star Trek began as episodic television, the Dominion War, the Xindi Arc, and Discovery‘s entire first season have made serialization the “new normal.” And I’m okay with that. But when every episode is advancing a larger season-long arc, it’s hard to tell a story like this one where we simply get to meet an isolated society and learn about their beliefs and customs (and rescue them, of course). However, this episode provided just enough of the larger storyline to keep it moving forward—the red angel, the dark matter asteroid, and now Tilly’s imaginary friend (who might be something more than a simple hallucination or a ghost…and might be a link to Dr. Culber’s return, as well). I’m hooked on this season’s arc so far, this strange interplay between science and religion. It seems promising and potentially hopeful—and that’s what I want out of my Star Trek, dammit! Jonathan Frakes knows Star Trek; that much is certain. He’s directed episodes of TNG, DS9, Voyager, and two of the feature films (First Contact and Insurrection). He also directed the first Mirror Universe episode of Discovery‘s season one. He’s actually become an accomplished director of countless other TV shows—just look at his IMDb page!—including NCIS: LA, Burn Notice, The Gifted, and even The Orville. 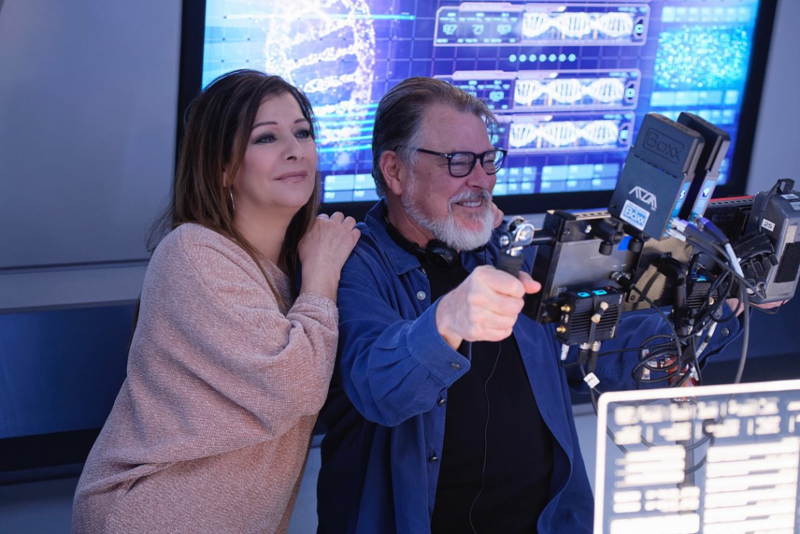 In fact, Frakes is one of the most experienced directors who works on Discovery (he’s returning to direct their ninth episode, too), and I think he’s actually the ONLY Discovery director who previously directed Star Trek on TV or film. But it wasn’t just Frakes who made this episode more Star Trekky. 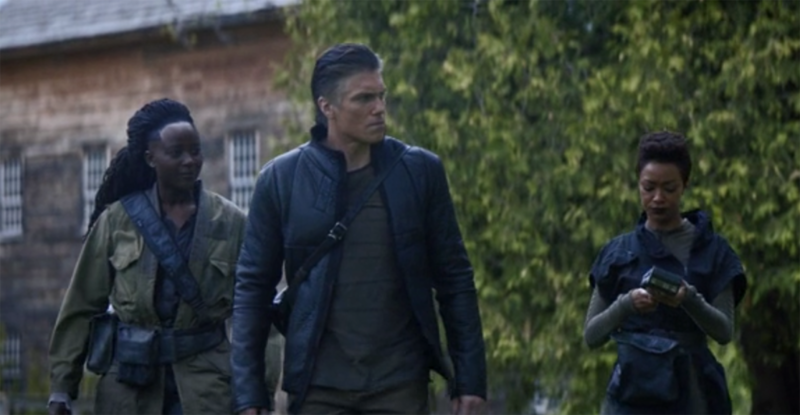 One of the writers of “New Eden,” Sean Cochran, also co-wrote the SHORT TREKS episode “Calypso,” considered by many fans (including me) to be the strongest episode of the bunch from an emotional, care-about-the-characters standpoint. His co-writer for that vignette, Michael Chabon, is also an avowed Trekkie (and a Pulitzer Prize winner!) who is leading development of the new Picard series…which one would assume will also have some episodes directed by Jonathan Frakes. Sean Cochan’s co-writer for “New Eden” was Akiva Goldsman, an Academy Award winning writer who will also be working on the new Picard series. This latest episode of Discovery gives me hope that “Picard Trek” will not trigger the same frustrations from me and other fans of “this isn’t Star Trek!” that Discovery initially did. Great article Jonathan…now that we agree again and if I promise to get good…can I join FFF again?? Sorry, Edward, but Fan Film Forum is not just me. There are other folks involved, and they don’t want you returning to the Facebook group. Just because you agree with me doesn’t get you back in. And a promise to be good is only worth the electrons it’s printed on. But you still get to post here on Fan Film Factor. Edward, we gave you lots of chances. And in the end, you begged me to kick you out. Actions have consequences, sir. Well, I can say that this episode does not displease me, (it’s not the same as saying that I liked it), but it’s a step in the right direction. It was more “Trek” than anything else I’ve seen so far, (except maybe Calypso ,, that I liked, no nuances). Burnham was not the Kryptonian that is usually … (I miss a big S on his chest). A broken clock tells the correct time twice a day ,,, I just hope that this is not the case and really, really have finally found a good watchmaker. Another magnificent episode, that’s two in a row! I agree…cautiously. Thus far, it does seem that there has been one heck of a course-correction from Season 1. Admittedly, two episodes hardly constitutes a trend but I’m (finally) optimistic. The question is: is it too little too late? Stay tuned! All Trek series, except TOS, took at least one season to hit their stride. TNG was unwatchable in S1 and not much better in S2. DISCO was uneven and problematic in some ways in S1, but it was never unwatchable. So, we should not be surprised if Discovery becomes “worthy” Star Trek in S2. That said, I am highly anticipating the Picard series in part because Trek will finally be moving FORWARD again. Season one of TNG was indeed weak. But season two included “The Measure of a Man,” “Q Who,” “Peak Performance,” “Pen Pals,” “A Matter of Honor,” “Elementary, Dear Data,” “Time Squared,” and “Contagion.” DS9 struggled through most of its first season, but “Duet” was masterful and “In the Hands of the Prophets” showed the series discovering its unique strengths. The first five or six episodes of Voyager were quite decent. Obviously, the show got immensely better after the addition of 7 of 9 and once the Doctor got his mobile emitter. Enterprise struggled through its first three seasons. But I promise to be good Mom and Dad…do I have to stay in my room? Actions have consequences. Even my eight-year-old knows that. It’s troubling that you’re making light of this, but that’s your choice. You’ve made many choices in you life, Edward. Others have made decisions regarding their interactions with you (or lack thereof) based on those choices you’ve made. I always enjoy your Discovery editorials Jonathan. Next Next post: RENEGADES has lots of MERCHANDISE for sale!